The results of excavations widen the knowledge of a series of daily facts and give to light the life in Pompeii like any work of art and any ancient text can do. 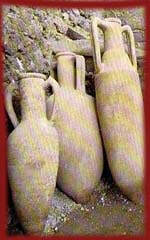 In the Regio I, district of artisans and small dealers, has been recovered in a house a small amphora still sealed, that contained the garum, the famous fish sauce so pleasant to the Romans. This sauce was prepared making soak, to the sun, entrails and fillets of raw fishes, envoys to layers in a container, with salt and sweet herbs, and eliminating partly the liquid produced by that elaboration. Despite the smell and the repellent aspect of the mixture, the garum was used in almost all the foods. Once examined the content of the small amphora found in the house, it is resulted that this garum, two thousand years old, had been manufactured not with mackerel, as usual, but with another blue fish, the vopa. Perhaps, according the home made recipe, everyone used the type of fish available; certainly there were different types of garum furnished by the laboratories, one of which has been found in Pompeii.